The above quotation comes from a short, light-hearted video of David Bowie playing David Bowie playing someone else. For this discussion, the relevant section runs from the beginning of the clip to spot 1:18, although I’ve included the entire video here in case you’d like to see it all. Please take a moment to watch the first minute and 18 seconds before continuing, as it’s both classic-Bowie funny as well as informative. If you’ve ever been confused about exactly who Aladdin Sane is, where he came from, and how he got into the Bowie mix, you’re not alone. The problem is there were so many look-a-likes operating at the time that it wasn’t always clear who was top dog (no pun intended, as the Diamond Dogs were also in play at the time). But going back to Bowie’s introduction, here’s that first Jean Genie video he referred to. Now let’s compare Ziggy to what we just saw from Aladdin. However, as Sheffield sees it, being under that influence wasn’t all bad. For one thing, it resulted in Aladdin Sane’s being, as Sheffield describes it, “a harder, nastier, gaudier album than Ziggy Stardust.” Just as the album was gaudier, so was Aladdin himself. Gaudy but elegant, one might say. Here, Bowie takes another stab at “Jean Genie” and nails it this time. Before going any further, I should point out that the famous picture of Bowie at the left is not the real thing. Instead, to jazz up a 1993 interview of the middle-aged Bowie, Q magazine, without Bowie’s permission, had a “computer enhancement company…. convincingly paint David’s skin” with the bolt design. It wasn’t his actual skin that was painted–as was the case when the bolt was first applied (The Ziggy Stardust Companion: Q Magazine Cover #80 1993). The “enhanced” photo was subsequently put into circulation under the guise of a picture for which Bowie had donned his Aladdin Sane make-up. Beyond that explanation, there are so many different versions of the bolt’s origins that it’s probably best to think of it as a collaborative effort. The collaborators were Bowie, fashion photographer Brian Duffy, and make-up artist Pierre La Roche. Duffy and La Roche created the original design right on Bowie’s face. (Bowie: Album by Album, Paolo Hewitt, p. 64.) Photographer Celia Philo was also a party to the collaboration. She directed that day’s photo shoot which resulted in the contact sheet of beautiful Aladdin Sane photos which fans have been admiring for generations (The Day that Lightning Struck, pp. 2-3). Despite his brief life span, Aladdin Sane enjoyed high visibility. 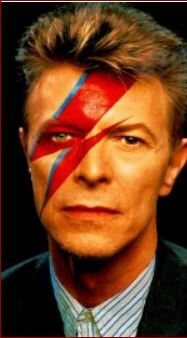 His face was featured on the cover of not only his own Aladdin Sane album (1973) but also on the Pin Ups album cover (1973) with British model Twiggy and the Diamond Dogs album cover (1974). By the time David Live (1974) was released, however, Bowie had shed his Aladdin Sane identity in favor The Thin White Duke. Even today, 40+ years after the fact, Bowie fans are still engaging heavily with the bolt–wearing it on jewelry and clothes, having it tattooed on their bodies, trading Bowie-with-Bolt pictures on social media, creating imaginative art of all kinds from it, and so forth. In that spirit, I offer, in no particular order or combination, a few striking examples from Twitter of the continuing allure of that bolt. One can’t help but think that DB would be pleased to see not only the way fans have continued to embrace the lightning bolt generation after generation, but also the ways in which many are according it equal status with his treasured Blackstar iconography. Thanks for exploring this post. I you enjoyed it and that you’ll visit some of my other David Bowie News posts in the blog section. I’m also on Twitter @revisingmyself. There I tweet mostly about Bowie but I also play excellent R&B and jazz as well as providing thought-provoking information on popular culture, current events, and history. And while you’re there, be sure to visit my growing collection of Collections (Uhmm…is there a better way to say that?). Be safe, God bless.